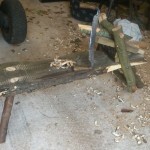 I have it in mind to make some greenwood furniture – we’ve had some work done on trees here in the big garden and the arisings will be ideal. Holm Oak is a great material – carves like cheese when it’s green but seasons to be as strong as iron! 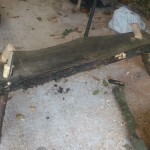 First stage is to build a shave horse, a combination work bench and foot operated vice. 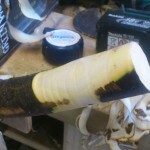 A leg prior to turning. 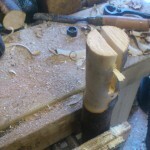 Turned to create a round tenon. 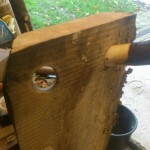 Slot cut to accept a wedge. 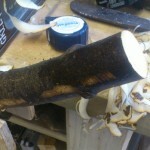 Legs fitted ready to be cut flush. I opted for three legs for more stability on uneven ground. 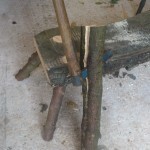 Splitting a log for the clamp. 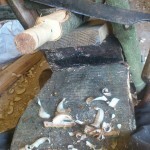 First use of the not quite completed horse, shaving down a peg to hold the lower part of the clamp.